This is an astrological chart for Islam. Yes, the religion. Left-wing astro-activist Caroline Casey provided it during a talk at the United Astrology Conference 2012, available here. 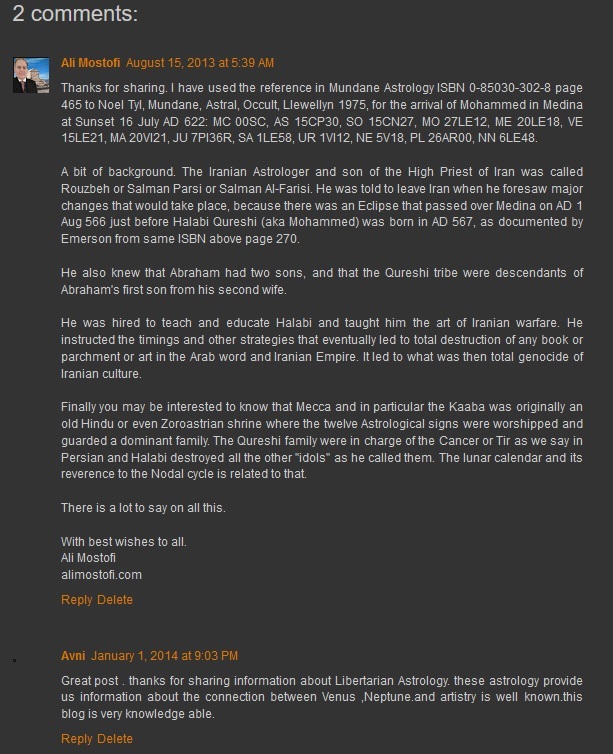 I make no attempt to evaluate the validity of Islam as a religion here: to do so would be beyond the scope of this blog and my capabilities as an astrologer. My own exposure to Islam is limited. There was that odd but extremely talented Egyptian kid in a kung-fu class I took years ago -- he boasted of getting major dental work without Novocaine and could duplicate Darth Maul's fight choreography from Star Wars, acrobatics and all. There's my neighbor, who's a quiet if imposing Nation of Islam guy: he did our apartment building a service a while back by chasing a burglar away with a baseball bat. There's Jack Fertig, who was an invaluable asset to the San Francisco astrology and gay-rights scenes, ridiculous Marxist politics and all. And there's these guys, who have been my favorite regular source of curry for over a decade. All things considered, my verdict has to be that Islam and person-hood are not mutually exclusive. Western media often portrays Islam as especially barbaric and violent, but in all fairness, these are traits arguably shared by Judaism and Christianity. The picture of modern Islam is further clouded by violent Western intervention into the Islamic world. Few recall the CIA overthrow of democratically-elected Iranian President Mossadegh in 1953 and the subsequent replacement of Iran's then-secular government with US-approved fundamentalists. Partisans of both the American Left and Right conveniently forget that the administrations of Carter and Reagan both funneled US taxpayer money into propping up the Mujahedin, the organization that would later become Al-Qaeda. These same partisans Left and Right also ignore the support of Al-Qaeda, the Muslim Brotherhood, and their recent activities by the Bush and Obama administrations. If modern Islam is particularly violent, one might make the case that Christians and Jews are deliberately funding the violence. Onto the chart: on the libertarian side, there's Pallas opposite the Sun and widely opposite Mercury; both Sun and Mercury are trine Pallas' ruler Jupiter. Pallas is also sesquiquadrate with the North Node. On the authoritarian side, Pluto is trine Pallas and semisquare Pallas' ruler Jupiter. This is fairly middle-of-the-road on the spectrum of libertarianism-to-authoritarianism, perhaps trending to the libertarian over time. Take away the Western tax dollars funding the extremists, and Islam might become a relatively benign neighbor. The action, politically speaking, is where the chart sits on the Left-to-Right spectrum. Neptune is conjunct the Moon and Mars (ruler of the Moon's domain, the Fourth House). Culturally, this is a far-left chart. This Neptune-infused Moon also rules Venus (money), and the South Node is in the Second House. Using my methods, which seem to work very well on people, Islam comes out very solidly into the "Partisan Left" category. Probably far Left. The tendency of Islamic countries toward poverty, extreme inequality of wealth, and socialism (I repeat myself -- all three are generally synonymous to those who understand economics). The descent of the Islamic world from the pinnacle of civilization many centuries ago, to the relative economic ghetto it is now. Yes, Western intervention probably plays a significant role: the Neptunian victim dynamic is at work here in addition to Neptune's ability to make money vanish. The refugee/outsider/dependent status (Neptune) of Muslims in Western nations. Contrast to whites, Asians, and Jews, who tend to easily climb the socioeconomic ladder when they live abroad. The empathy the far Left in the West have for the religion: they are fellow Neptunians. The hatred the Right in the West have for the religion (the Right essentially being a loose anti-Neptune alliance). The praying-five-times-a-day thing: bringing the normally secluded Neptunian worship function out into the open, integrated with "worldly" life. This and other facets of the culture suggest a prevalent Neptunian erasure of individuality. Relative lack of strong racial/cultural bonds outside of religion (Moon-Neptune). Muslims living in Islamic "nations" (many artificially created by the West) or others tend not to psychologically invest in their ruling states. Christians, in contrast, have usually allowed national/racial "identity" to override their faith--they have happily marched to war for their countries to kill foreign Christians. The concealment of women (Moon-Neptune, get it?). Here in the West, women aren't hidden but get the hyper-idealistic side of Moon-Neptune, in which they have to perform most of their traditional "feminine" functions and all the functions of men in the workforce and live up to unrealistic Hollywood standards of beauty, to boot. Arguably, this is another form of concealment. 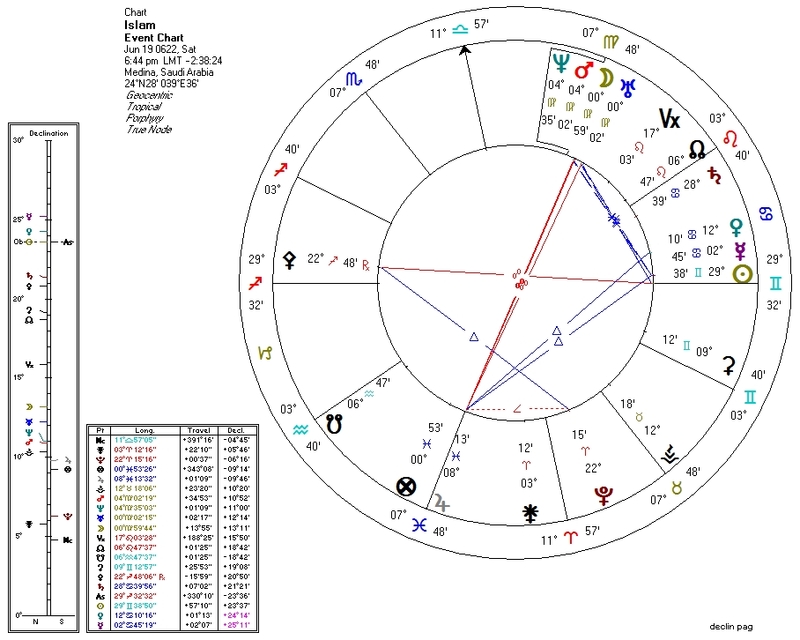 Yes, the fact that Mars and Uranus are also conjunct the Moon on the chart may explain a few things about Islam and women that don't quite correspond with the rest of the Neptunian Leftist world, including "sexual jihad". This also explains the Islamic tradition of cutting off (Mars/Uranus/Neptune) body parts (Moon) of criminals. The amazing art and architecture. The connection between Venus/Neptune and artistry is well-known. That the depiction of holy personages is forbidden is yet another Neptune symptom. American rappers. Islam claims a disproportionate number of the better wordmongers. Sufism. I don't think Judaism or Christianity have any offshoots quite so deliriously rapturous. Assuming the validity of this astrological chart, Islam is by far the longest-lived Leftist/Neptunian culture alive today. For good and ill, it may suggest the possible future of the West's newer Leftist/Neptunian movements. Is this is where "progress" leads?